This is a funky drum, you can imagine it on dirtier, bluesier grooves and New Orleans second line rolls, not to mention smoky nightclub jazz. Perhaps the most gorgeous of all the Black Panthers. Sophisticated balanced tone. The 14"x5 1/2" Retrosonic is a real looker, perhaps the most gorgeous of all with the glorious swirling grain of rich walnut finished to a satin-smooth sheen. 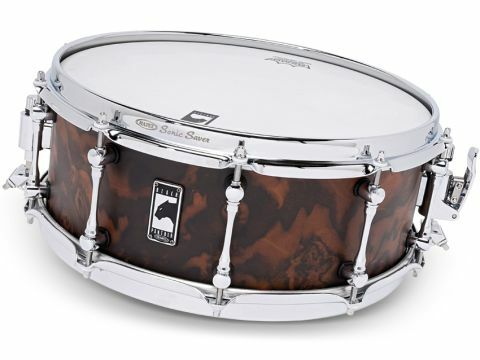 It's a relatively hefty 8.1mm all-walnut shell and has Mapex's so-called 1:9 bearing edges where there is a 45 degree slope right up to the sharp outer edge. Extremely shallow snare beds are cut almost imperceptibly, but this seems to be enough for them to work just fine. The micro sensitive new strainer plays its part in this. Chrome hardware and tube lugs compliment the dark wood perfectly. Rather like the Velvetone, this drum has a sophisticated flavour with a dusky undercurrent. There is a good balance of bright and dark. Attack-wise, rim shots and cross-sticks cut the mustard with a tasty balance of woody and metallic tones. It's easy to be led on by the dark hue of the wood, but the drum does feel deeper than maple or birch, somehow a bit richer and thicker.